Going further, is there some sort of civic engagement that is just waiting to be tapped? The press coverage of Big Society is dripping with scepticism about this. But I’m not so sceptical – if use of the internet is to become an integral part of the Tories’ plans. 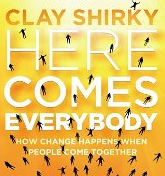 As Clay Shirky argues in Here Comes Everybody, the net allows activities that were previously unviable (under the Coasian floor as he terms it) to actually happen. Essentially the dramatic decline in transaction costs made possible by the internet makes social collaboration possible even in areas where it could never previously have been envisaged. It’s explained more here, 3rd paragraph. Is it just understanding that is beyond the imagination of our politicians and press? Hmmm, I think there is something to that – the whole term *could* be to just dress up government cuts in other language. But I’m convinced there is something here, some way that social action can be built without the state, and that’s an idea that should appeal to both left and right. As for whether I can possibly advocate all of this – well I’m doing my little bit by writing hopefully thought provoking blog entries, but on the Labour side there’s a fair way to go. Perhaps the idea is to distract you into arguing about it? Perhaps just set goals and go after them and let them argue with you?